In an industry where innovation is key, Nintendo’s bringing game-changing elements such as the GamePad, a tablet-controller hybrid, and expanding the capabilities of their console in a bid to remain relevant. In addition, it looks like they’re putting a lot of faith in social media by creating their own platform with the Miiverse. But what is Miiverse exactly? 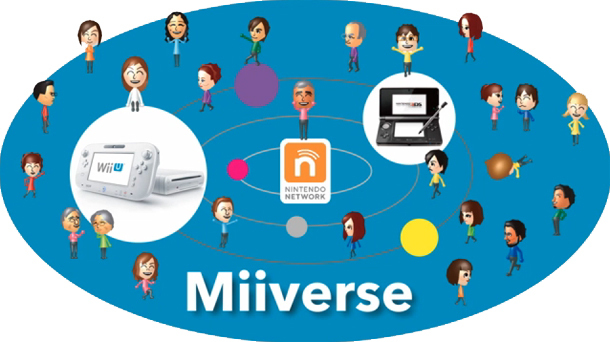 Miiverse will be a virtual hangout that will be available once you switch on your Wii U. Its a virtual hang-out where your avatar can walk around and interact with other player avatars. You can post your thoughts using text or drawings, much like updating your Facebook status or sending out a tweet via Twitter. And while the Miiverse will be initially available only through the Wii U, Nintendo has plans of making it available through any device that can go online. Honestly, I’m a little skeptical about introducing another social media platform but it would be interesting to see where Nintendo intends to go with this. The concept isn’t entirely new in the gaming world either; Xbox Live and its avatars immediately come to mind. But it looks like Nintendo is expanding on it by making the whole thing more interactive. will it be the killer app that Fils-Aime is predicting it to be? That all depends on how many of you out there end up adopting it. Are you excited about Wii U and the Miiverse? What would make you want to try it out? Let us know in the comments!